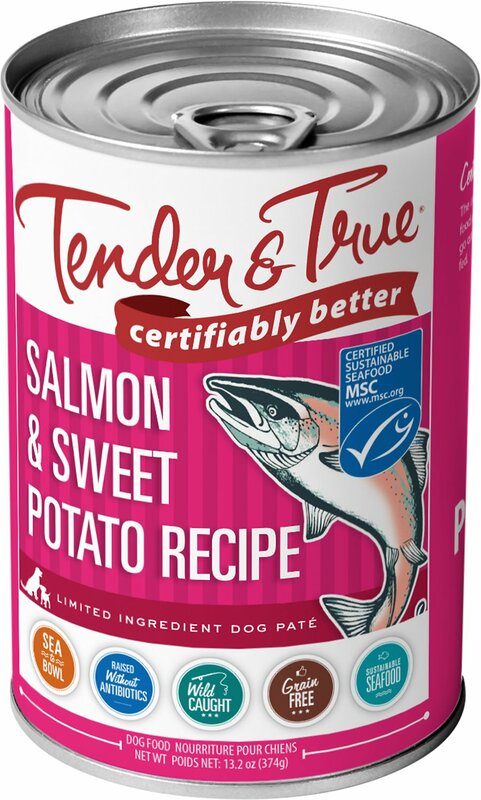 Feed your pet the same wholesome nutrition you would feed yourself with Tender & True’s Salmon & Sweet Potato Recipe Grain-Free Wet Dog Food. This palatable pate is crafted with wild-caught salmon as the first ingredient, which is considered Certified Sustainable Seafood by The Marine Stewardship Council (MSC). It also contains other recognizable ingredients like real dried sweet potato, plus it has a beneficial blend of vitamins, minerals and other trace nutrients. And there’s never any poultry, grains, corn, wheat, soy, antibiotics, GMOs, or artificial preservatives, colors or flavors. Every serving offers dogs from all life stages the complete and balanced nutrition they need. Crafted with sustainable seafood that has been Certified by The Marine Stewardship Council (MSC). Contains wild-caught salmon as the very first ingredient, along with real, dried sweet potato. Grain-free recipe made without corn, wheat or soy. 100% free of GMOs, antibiotics and artificial colors, flavors and preservatives. Packed with vitamins, minerals and other trace nutrients to support your dog’s overall health and well-being. Salmon, Water Sufficient For Processing, Dried Sweet Potato, Dried Pea, Salt, Agar-Agar, Tricalcium Phosphate, Dried Fish Broth, Magnesium Proteinate, Calcium Carbonate, Potassium Chloride, Choline Chloride, Taurine, Ascorbic Acid, Vitamin E Supplement, Zinc Proteinate, Zinc Sulfate, Manganous Oxide, Manganese Proteinate, Inositol, Ferrous Sulfate, Niacin, Vitamin B12 Supplement, Zinc Oxide, Iron Proteinate, Thiamine Mononitrate, Biotin, Riboflavin Supplement, Calcium Pantothenate, Pyridoxine Hydrochloride, Sodium Selenite, Copper Sulfate, Vitamin A Supplement, Copper Proteinate, Citric Acid (Preservative), Vitamin D3 Supplement, Folic Acid, Potassium Iodide. For adult dogs feed 1 1/2 to 3.5 (13.2 oz) cans and 3 2/3 to 8 (5.5 oz) cans per day for each 20 pounds of body weight. For pregnant and nursing mothers and for puppies up to 1 year of age feed up to 2 times as much as for adults or up to 6 (13.2 oz) cans per day. The amount of food your dog requires will depend on activity, age, environment, breeding status, and breed. Feed at room temperature and refrigerate unused portion in a sealed container. Remember to always keep fresh, clean drinking water available for your dog. New to this food? Please transition your pet. 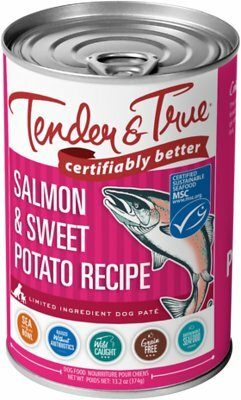 When changing to Tender & True Salmon & Sweet Potato Recipe Dog Food, some dogs may do better by making a gradual transition over 7 to 10 days. Start with 25% of the new food mixed with 75% of the previous diet, and gradually increase the new while decreasing the previous until the transition is complete.